Announcing the 2018 Rock Talks Summer Schedule! Join us this summer every Tuesday and Friday at 11 am for Rock Talks at Crystal Cabin! In this 30 minute fun and interactive tour expect to learn about Haida Gwaii’s unique geological history, including Introduction to Stones from Haida Gwaii; Geological Formation of the Islands; Tlell Stone Circle Tour; Identify Agates and Learn How They are Formed. Announcing the 2017 Rock Talks Summer Schedule! Join us this summer every Friday at 11am for Rock Talks at Crystal Cabin! 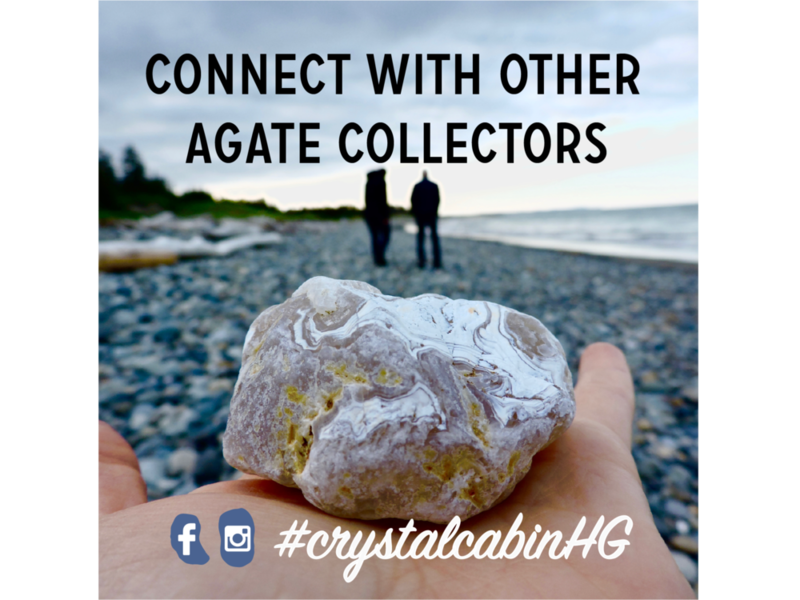 Connect with Other Agate Collectors using the hashtag #crystalcabinhg on Instagram or Facebook! If an agate is found on the beach and no one knows about it, did it really happen? If you’ve found a beautiful specimen we invite you to share it on Facebook or Instagram – just tag us at @crystalcabingallery and use the hashtag #crystalcabinHG. We’ll be on the lookout for your beautiful agate finds and we’ll share our favourites! Join in on the action and follow-up on Facebook and Instagram. Agate Collecting with Dutes: Your Guide to Finding Agates in Haida Gwaii will be available May 1, 2017 to purchase at select retailers, Crystal Cabin in Tlell, Haida Gwaii or online at www.crystalcabingallery.com. Crystal Cabin invites agate enthusiasts and novices alike to attend the book launch. Bring your questions and your friends!